Personalize your work space with a photo gift thats fun and functional. The Photo Frame Table Clock is a personalized clock with a wooden base. Impressive pictures or texts can be printed accurately on the hardboard of size 8" x 6". The board simply slides into the channel and generates into a very graceful gift item. A suitable idea for corporate and personal gifting. 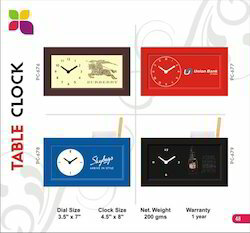 Our esteemed and valued clients can avail an exclusive range of Table Clock With Photo Frames from us, which are available in different sizes, shapes and other specifications. We make use of quilt approved raw materials and modern technology tools in crafting these frames in beautiful and attractive manner. Being a well-distinguished company in the market, we are into offering Photo Frame Table Clock. Matching up with the ever increasing requirements of the customers, we are engaged in providing Photo Frame Table Clock. Personalize your workspace with a photo gift thats fun and functional. The HBC-86 is a personalized clock with a wooden base. Impressive pictures or texts can be printed accurately on the hardboard of size 8" x 6". The board simply slides into the channel and generates into a very graceful gift item. A suitable idea for corporate and personal gifting.